Burst Media has released the results of a survey on media consumption of 18-24 year old college students, reporting that students spend more time with the Internet than with other media. Burst also reports that Internet audio and video were two of the students’ top reasons for using the Internet. Burst recommends Internet media as the most effective tool for reaching college students. One third (33.0%) of college students spend more than ten hours per week on the Internet, and 19.6% spend more than 20 hours per week online. Among college students, Internet usage levels surpass those of television and terrestrial satellite radio. 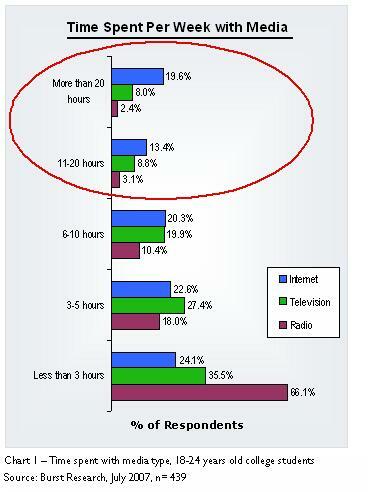 While one in three college students are heavy consumers of the Internet, only one in six (16.6%) watch more than ten hours per week of television and merely 5.5% listen to terrestrial/satellite radio more than ten hours per week. College students are multi-taskers ‚Äì often consuming different media simultaneously. In fact, one-half (50.6%) of college students surf the Internet while watching television and 43.5% are online while listening to terrestrial/satellite radio. Top activities for students include downloading music (53.3%), listening to Internet radio (44.5%) and viewing streaming video content (42.6%).